The first strange thing about Portchester castle is that no one knows when it was built. For such an important strategic position and being of quite a large design there should be at least some kind of mention about when it was built, however no official documents make any sort of claim to this, though historians have speculated that it was constructed some time during the late 11th century. Thought to have been built on the orders of William Maudit who was an associate of William the conqueror, in the aftermath of the Norman invasion. It was built upon the site of a much older Roman fort, making it the site of some sort of military presence for at least 2000 years. The second odd thing about the fort is that it seems to have been designed as just a more fortified Roman style fort, which was common for estates but not for castles. The problem with this design is that the defensive buildings are quite far away from the walls, so if it were breached in a single place the entire courtyard would be lost at once. The castle was considered one of lesser importance in the country and was left with no maintenance for the next 200 years after it was built. It was used as a personal residence more than one of significant military value, and this was probably the reason no one ever bothered to attack it. After it left royal control in 1632 its main function turned to the incarceration of criminals and prisoners of war, and the castle held 500 prisoners from the second Anglo-Dutch war in 1665. It was last used in the 19th century as a gaol for over 7,000 French prisoners during the Napoleonic wars. Today the castle is cared for by English heritage and is open to the public as a tourist attraction. There is also a legend attached to the castle where it is said to be the final refuge of Pontius Pilate, who was in charge of the trial of Jesus Christ. 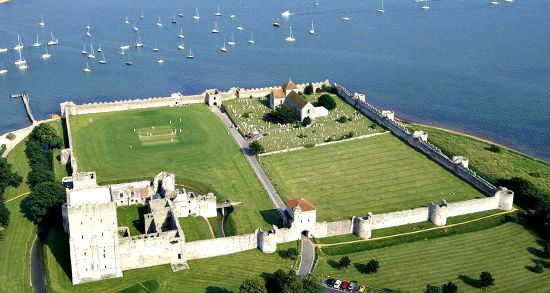 The most haunted area of Portchester castle has to be the church. Built in the 12th century the church would have seen countless weddings, holy ceremonies and burials, and seems to have held onto a couple of spirits from this time. One of the most commonly encountered is that of a woman dressed all in black, who has been seen bending over one of the grave stones. The second is that of a monk, who's apparition has been witnessed walking around the outside of the castle wall on the corner where the church is. People who claimed to have seen him say he fades away if you watch him for long enough, and he is always seen at a distance, never when people are on the waterfront. Also he is said to give off a very friendly vibe, with no one claiming to have ever felt scared while gazing upon him. The courtyard is said to have its own ghostly rider, who has been described as most probably being from the Civil war ear, who has been seen and heard trotting through the central path of the castle. Apart from these there are a few others, with stories about the ghosts of prisoners and a few apparitions in the keep, but these are no were near as commonly reported as the above three.